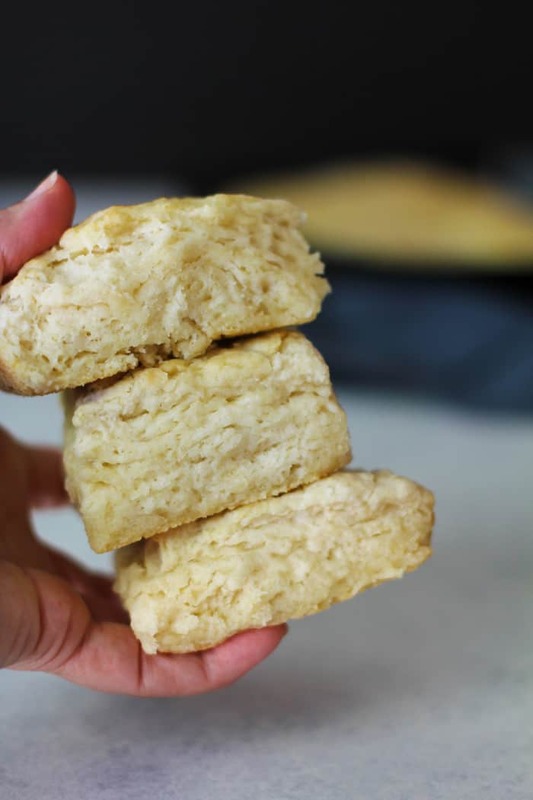 My buttermilk biscuits are perfectly flaky on the outside, and soft and fluffy in the inside. These make the BEST snack or side, with a few pats of butter and a drizzle of honey! 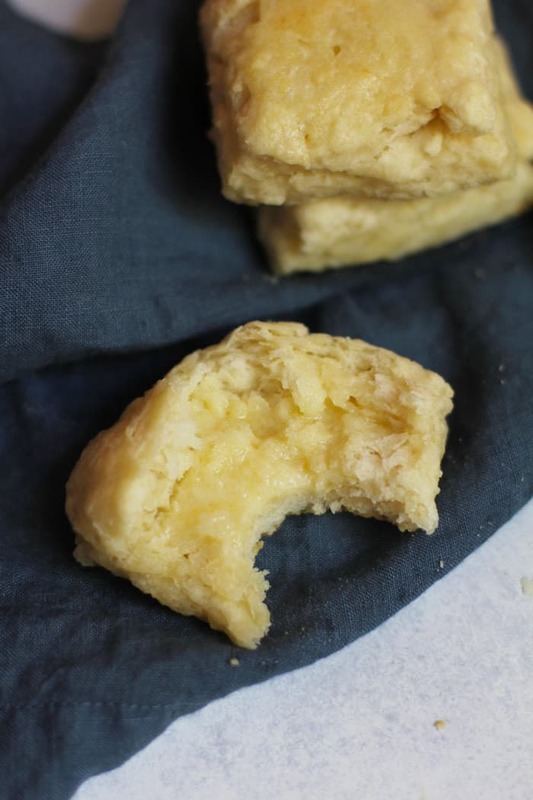 Oh buttermilk biscuits. How I LOVE you so! As some of you know, my hubby and I went to Waco in May for The Brave Like Gabe Marathon. Mike ran the 1/2 marathon in preparation for his full marathon in June. Whenever we travel for a run, we always explore the area and find fun things to do. EATING is always #1 on the list, so of course we had to go to the Magnolia Table – Chip and Jo’s new restaurant. 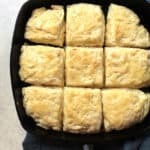 After tasting Joanna’s buttermilk biscuits (with strawberry butter) that were to die for, I knew I had to create a recipe for ya’ll. For ALL of the DEETS on what we did and what we ate and where we shopped in Waco (duh), head here. If you ever get a chance to shop at Magnolia and eat at the Magnolia Table, DO IT! 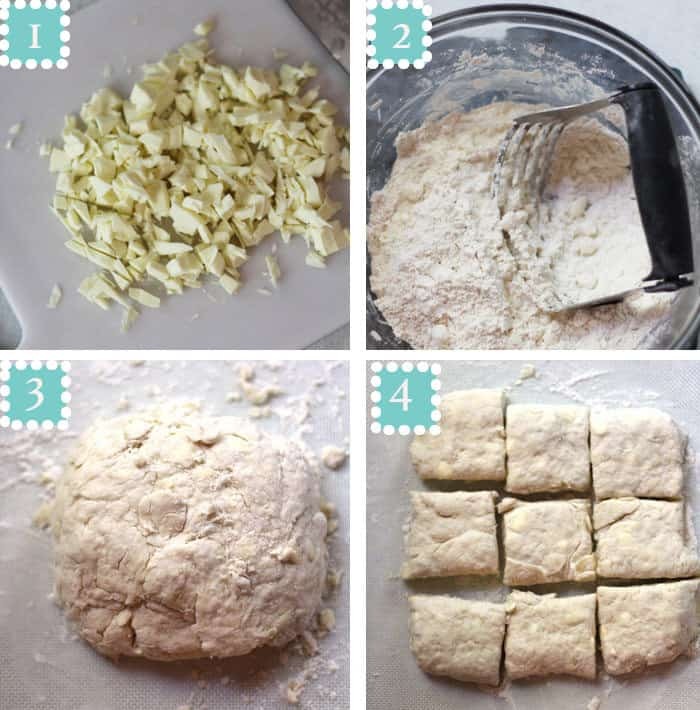 Making biscuits is similar to making scones (which are my favorite thing to bake), but simpler. Like way simpler. You will need only SIX ingredients. The technique for making biscuits is the key. I made them several times, and I’ll explain what I learned. Tips for making epic biscuits. Frozen butter. Make sure you chop up your frozen butter, and return to the freezer. Remove only when you are ready to add it to the flour mixture. COLD buttermilk. Leave your buttermilk in the refrigerator until you need it. Just the right amount of liquid. When you add the buttermilk, don’t over pour. In fact, add slightly less than the recipe calls for, and add as you need. You will know that you’ve got enough buttermilk when the dough stays mostly in tact. to work the butter in. HOT oven. 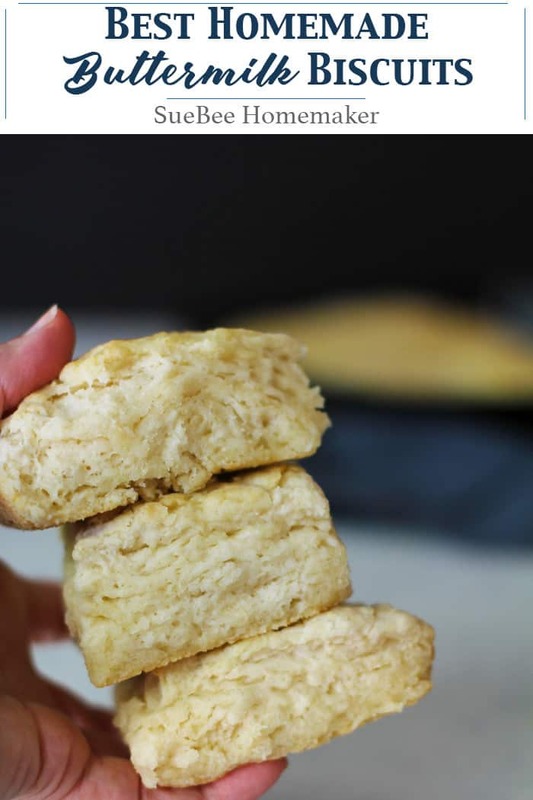 Bake your biscuits at 450 degrees to get them nice and golden on top, while maintaining a soft interior. Like I said, I tested these biscuits several times. I’d read that the key was to create the flaky layers by folding the dough, flattening, and then folding the dough again, (up to six times), etc. When I folded the dough, I didn’t have good results. All that handling of the dough created a flatter biscuit for me. So I went the easier route, and just skipped the folding. Instead I simply formed a large square, and cut the dough into nine biscuits. Feel free to experiment with either method. And please let me know what works best for you. Happy biscuit making! 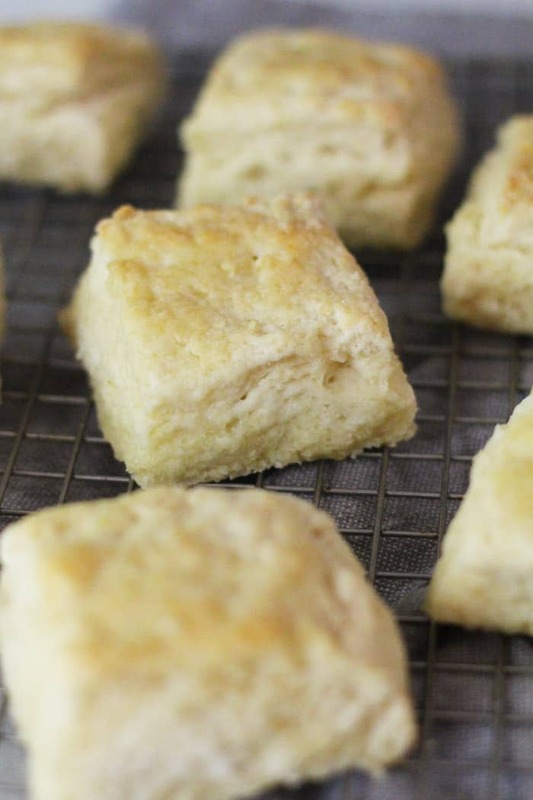 My buttermilk biscuits are perfectly flaky on the outside, and soft and fluffy in the inside. These make a great snack or side, with a few pats of butter along with a drizzle of honey! Preheat oven to 450 degrees. Prepare a skillet with baking spray. Take the frozen butter and chop into small cubes or pieces. Place back in the freezer. Using a mixing bowl, combine flour, baking powder, salt, and sugar. Mix well. Using a pastry cutter, cut the cold butter into the flour mixture. This may take a minute or two. Create a well in the middle of the bowl, and add the buttermilk. Stir until the mixture becomes a ball. You will have to eventually use your hands to get the dough to stick together. If it's still not forming a ball, add a little bit more buttermilk. On a well-floured surface, place the dough, and flatten with your hands. Form a square that is approximately 1/3 of an inch. Slice into 9 even pieces, and place in skillet. Spray tops with baking spray. Bake for 12 - 14 minutes, or until top becomes slightly golden. Remove, slather with butter and honey, and EAT! Just the right amount of liquid. When you add the buttermilk, don't over pour. In fact, add slightly less than the recipe calls for, and add as you need. You will know that you've got enough buttermilk when the dough stays mostly in tact. 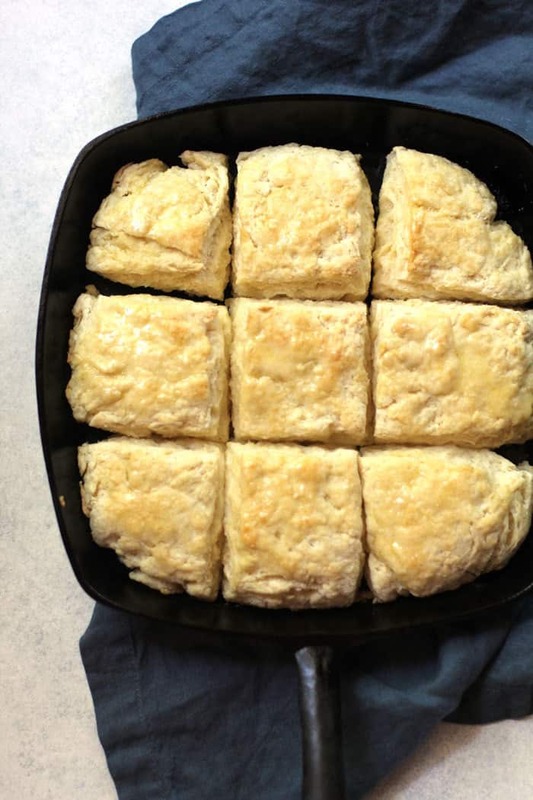 These biscuits look so delicious and perfect for brunch! It’s hard to believe this tastes so good and it only has 6 ingredients! Our Waco trip was so much fun and I am anxious to go back next Spring. The good news is that I don’t have to wait as I can eat biscuits as often as I like…… and boy do I like!